Intake spacers help to isolate the intake manifold from the conducted heat of the engine block. Our spacer is made from heat resistant Aramid Fibers with a nitrile binder. This is a self sealing spacer/gasket with no additional gasket(s) needed. 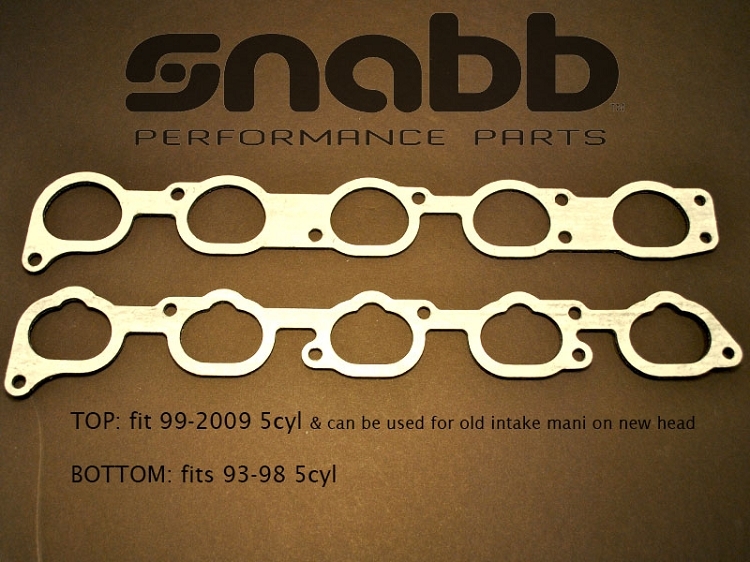 Snabb's exclusive spacer not only blocks conductive heat from the aluminm engine block but is resistant to heat, water, aliphatic hydrocarbons, oil and gasoline. It also has a very high tensile strength of 1500 psi. Specs aside, does it work? YES! Average decrease in Intake air temperature is 15 degrees f but we've seen as high as 25 degree f reduction in IAT's. Our spacers have a very low thermal conductivity of 0.29-0.38 w/k*m (the thermal conductivity of aluminum is 250 w/k*m) which results in significantly less heat being directly conducted to the intake manifold and therefore lowers the intake air temperature, in turn creating more power. Please note that it is imperative that the spacers be torqued down in stages to no more than 15 foot pounds. The spacers may crack or deform if over torqued, it is recommended that they be installed by an ASE certified technician. Did several before and after checks to compare the intake manifold temperatures in mid Texas summer heat. Average difference was 33 degrees Farenheit lower, using a laser temp gun, after 35 min of stop n go traffic. I can hold my bare hand against the manifold now and it is only mildy warm. I would buy this again, definitely. Plus, not having to use 2 gaskets is a bonus as well!